This month’s strategy question of the month focused on practice group management. Specifically, we looked at the question of whether there is a link between what we ask practice groups (and their leaders) to do and perceptions of how effective those groups are. The least effective groups are more likely to be working on knowledge management and practice support vendor integration than the most effective groups. The survey asked two questions. 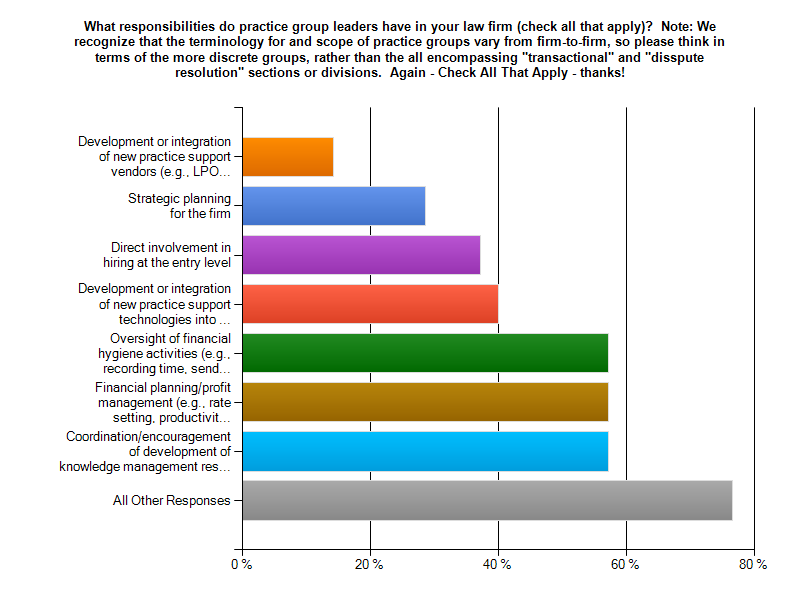 First, law firm leaders were asked to identify what responsibilities practice group leaders were given in their respective firms (from a list formatted as a “check all that apply” question). Second, law firm leaders were asked to rate the overall effectiveness of practice group leadership at their firm (where 1= not effective, 5 = moderately effective, and 10 = extremely effective). As noted above, ratings of overall effectiveness remain mediocre on balance. Roughly, one quarter of managing partner and/or COOs consider practice group management at their firms to be highly effective. 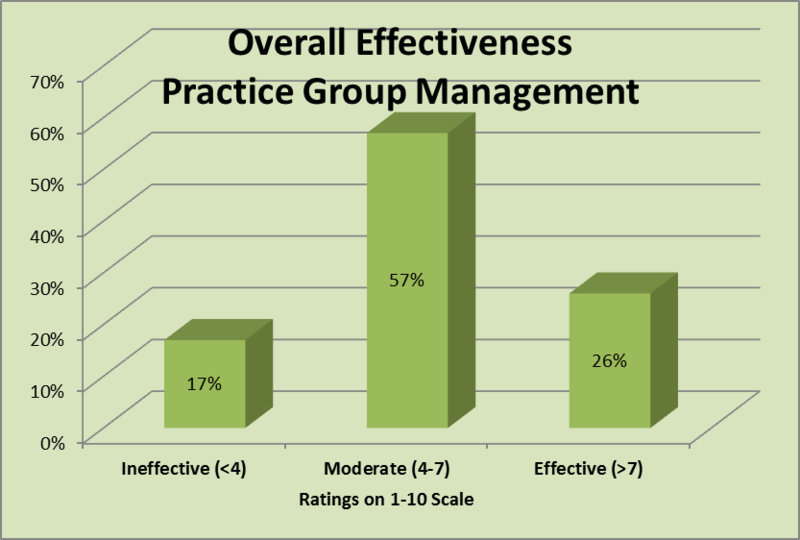 Well over half consider practice group management to be only moderately effective. 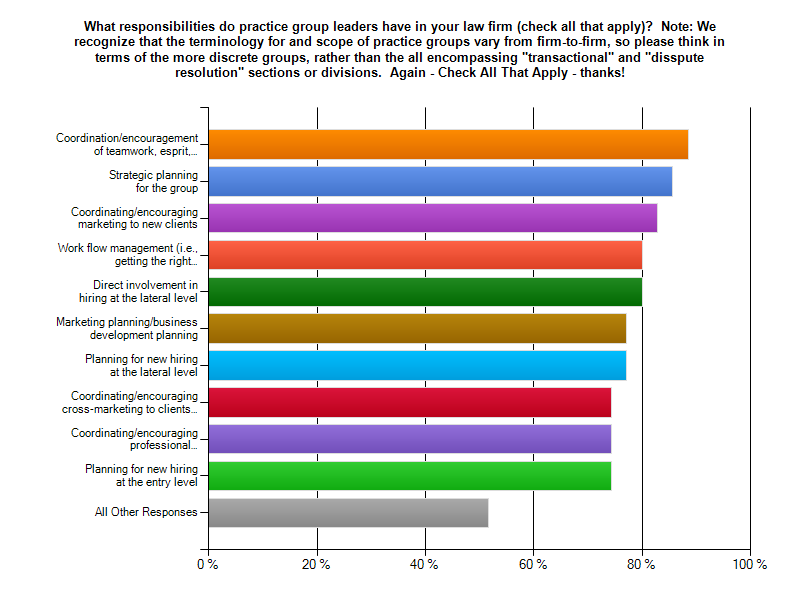 The remaining respondents consider practice group management at their firms to be largely ineffective. The key question then becomes, what distinguishes the most successful groups from the least successful groups. Note that both highly effective and ineffective groups have some common responsibilities: marketing and new business development (coordination and planning); people management (work flow management, professional development oversight, and planning for entry level hiring); and team building (encouraging teamwork and morale and coordinating group level planning). Highly effective groups did differ in important ways. First, and most dramatically, highly effective groups were almost three times more likely to be expected to plan for and coordinate cross-marketing activities – both inbound (i.e., seeking work from clients of other groups) and outbound (i.e., encouraging cross-marketing the groups’ clients to others in the firm). Second, highly effective groups were more likely to be asked to focus on the financial performance of their groups – both profit planning and day-to-day administration and hygiene. In fact, the highly effective groups were almost twice as likely to be involved in financial planning and profit management as the least effective groups. Although less common overall (see overall expectations below), leaders of the more effective groups were considerably more likely to be involved in firm level strategic planning than leaders of less effective groups. Leaders of the most effective groups were also moderately more likely to be involved in lateral hiring (planning for and executing that hiring), in setting partner compensation, and in acting as a channel for inter-practice and firm level communication. The less effective groups were considerably more likely to be given responsibility for activities that were – on balance – not priorities across the larger survey sample. The less effective groups were considerably more likely to be involved in activities that rated at the bottom of the longer list of responsibilities of practice leaders (see the section below on practice group responsibilities). When compared to the most effective groups, the less effective groups are more likely to be working on two things in particular. First, the less effective groups are nearly twice as likely to be working on knowledge management activities (e.g., form files, brief banks, etc.) than are the most effective practice groups. Second, the less effective groups are much more likely to be working on the development or integration of new practice support vendors (e.g., LPO vendors) into the practice than are their counterparts in other firms. The less effective groups also appear to be somewhat more directly involved in the entry level recruiting process than their counterparts in more effective practice groups. To some extent, the differences the most and least effective practices may reflect the size of the responding firms and/or the availability of non-lawyer support. However, differences regarding the heightened focus on cross-marketing and profit management cannot solely be dismissed as being a function of firm size or the availability of support resources. The survey provided a useful snapshot regarding what responsibilities are most (and least) common for practice group leaders. We will return next week with some follow-up discussion of both this month’s findings – as well as last month’s findings regarding partner compensation systems. Until then, we welcome your comments below and/or via email to jsterling@sterlingstrat.com. This is interesting and warrants more exploration. I would like to see some differentiation between practice groups that have management responsibility for a practice area (ie: chair of labor & employment dept), and a practice group that is primarily a “go to market” practice area such as an industry team. Bob – Very good point. The substantive legal practices tend to have an easier time balancing work flow and managing professional development. But, the industry teams (especially those with strong market reputations) tend to do better on marketing and business development. We will almost certainly return to this topic – and get a deeper dive – on a future question of the month.